Even though I couldn't be with my family for Christmas this year, thanks to Face Time we were still able to open our presents together. Isn't technology grand? I was thrilled at the thoughtfulness of the gifts from my children; both of them did so well at picking just the perfect presents for me. Baby Girl and I share a love for museums and unique handcrafts, so I was thrilled with the very unique Morse Code necklace that she found for me at the Metropolitan Museum of Modern Art. It was designed by Rebecca Coagan Scharlatt and is also available in her online store. 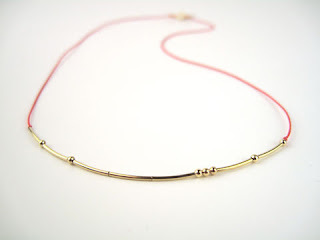 Each necklace is made of a fine silk rope strung with gold beads and tubes representing dots and dashes of Morse code. My necklace has seven tubes and no beads, representing the code: dash-dash dash-dash-dash dash-dash, which translates to "mom". My boy had a bit of help from his girlfriend choosing my gifts, I think; although he's quite capable of choosing gifts all on his own that bring tears to my eyes. They did their shopping at Connecting Threads, starting with a kit to make an adorable Cuddle Bug baby quilt and matching pillow, complete with the fabric needed to make the backing. Of course I was curious if they were trying to...ahem...tell me something, and all my boy would admit to is that once I make the quilt I should hold on to it. Knowing that troublemaker of mine, he's simply trying to yank my chain a little so I'm not holding my breath on becoming a grandma any time soon. Another part of their gift was a "needle nanny", which is something I'd never seen before. It's made of metal and has a strong magnet, making it perfect to attach to your shirt or project and hold your needle when you need to take a quick break. And it's so pretty, too! 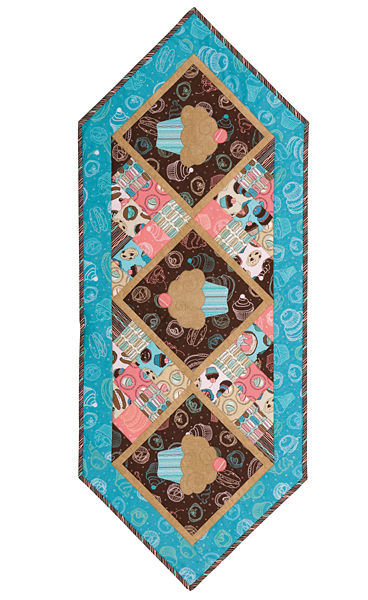 They also gave me the All Things Cupcake runner kit, which is a perfect quilt project for a beginner like me. Since I haven't actually started the kit that I bought myself for a lap quilt that was intended to be my first quilt project, looks like this cute runner is going to have the honor of being first. 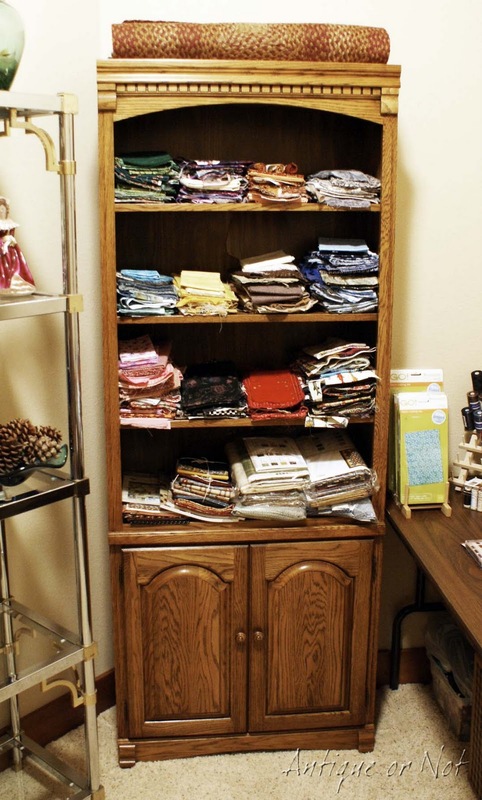 Aren't those colors and fabrics scrumptious? All in all, my kids did a great job at making their mom very happy this Christmas. They are both planning on coming out to Idaho to visit in February, so I'll have a chance to spoil them both while they're here. They may be adults and all grown up now, but I miss those kids something fierce! 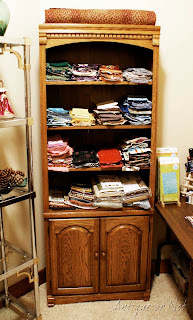 My Christmas present from Hubby was my sewing machine that I told you about here, plus all of the other sewing paraphernalia that I've been accumulating since then. Aside from the pincushions that I made, I have yet to produce anything out of it, mainly because I was trying to sew on our kitchen table and that wasn't working out too well. 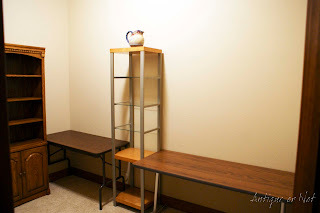 In an effort to make me "put up or shut up" I think, Hubby pulled several bookcases out of a tiny windowless room in the basement we're using to store some of my inventory and replaced them with folding tables. Then I was able to organize all of my sewing stuff and create a "craft room" of sorts, or at least the beginnings of one. The wood shelf sitting on the floor on the right is going to be hung on the wall, after my sweet Hubby prims it up for me first. That will hold sewing notions and tools. That baby quilt kit is so adorable!! 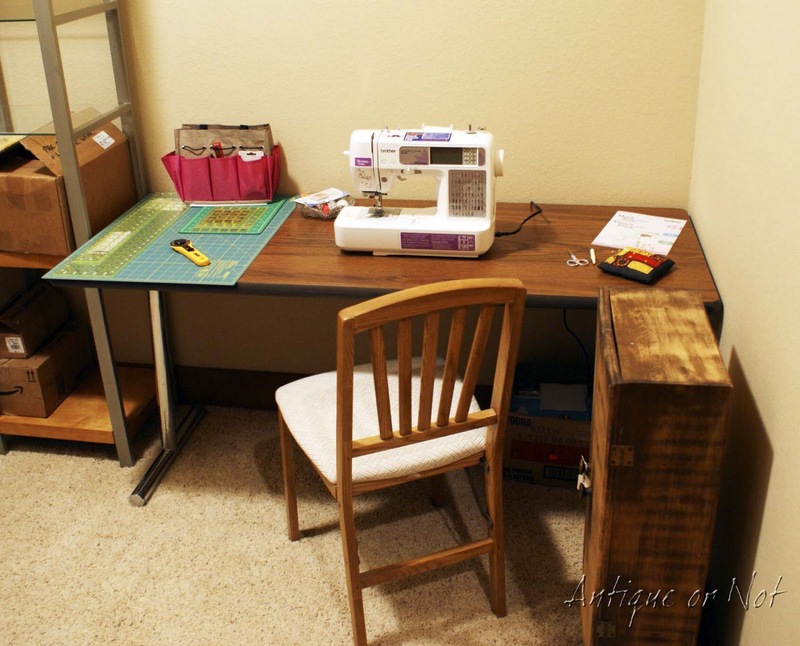 Yay...a sewing/craft room of your own. What a great start on making a special place for you to create. My sewing room is pretty small, but I love it and know where everything is. what great gifts from your kids...and the baby quilt...hmmmm? I'm not quite sure what that means...lol. 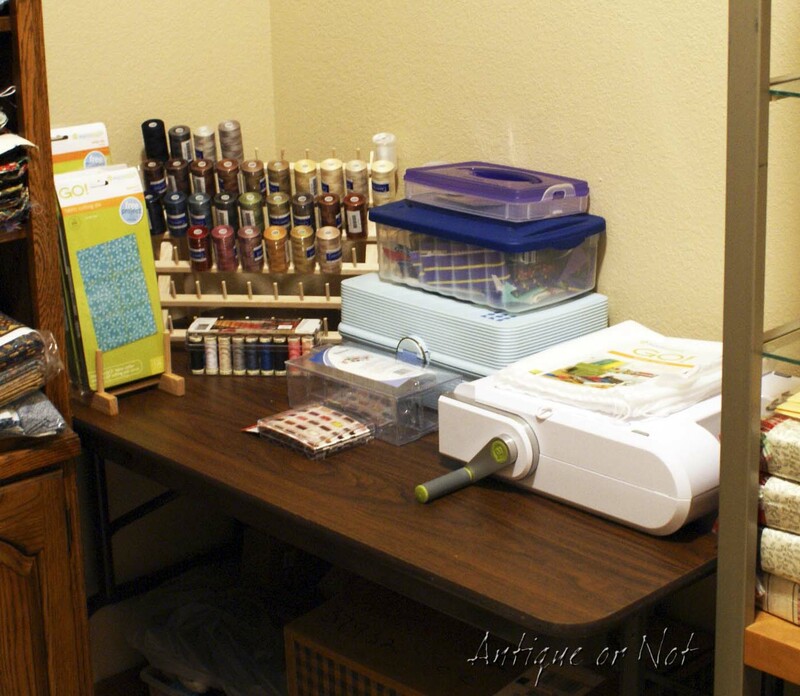 Love the new craft room. A space for creativity. Great gifts from your children. I'm going to have to look for that needle nanny. I really can use that. 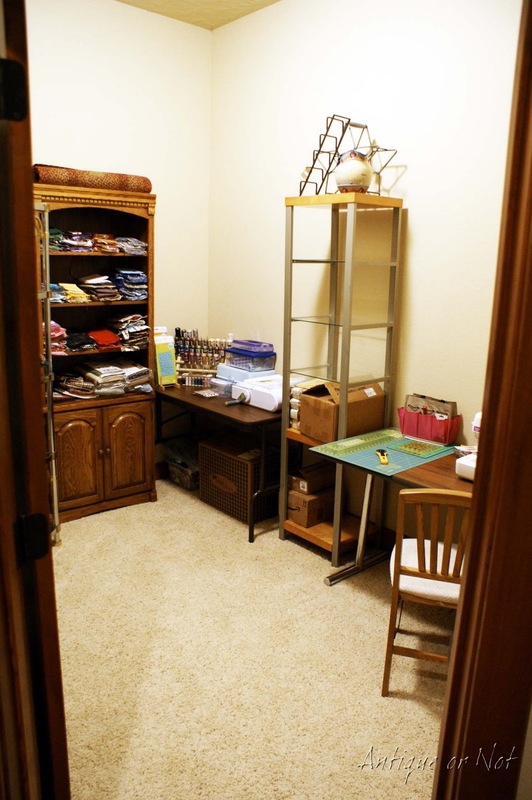 Nice sewing room..it's always nice to have space of your own. Happy sewing! Looks like you had a wonderful Christmas! Your son's gifts make me wonder though... :) Ha Ha! My parents got me a Serger and Tim shocked me big time for the first time in our marriage... He bought me the new Nikon DSLR with 2 lenses, the bag, a camera school DVD, the camera card, etc etc. Needless to say I was so SHOCKED when I opened it that I cried and I'm not a person that cries! I feel super spoiled this year! Such great gifts!!!!!! You raised your children well! HAHA So sweet..
You did a great job on the craft room. It's going to be nice. Hubby did good. And so did your children, what special gifts. I'm so glad that you had a nice Christmas.